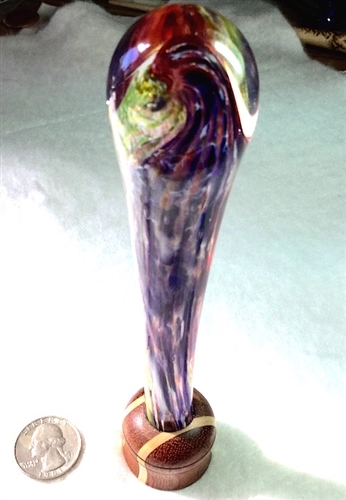 One of newest additions is this blown glass shaft with wooden support lap spindle bowl. The wooden bowl is Bubinga wood and Maple and her blown glass shaft has beautiful shades of purple, rust, greens, with a sprinkling of gold adventurine. She measures 6 3/4 inches tall and the bowl measures 1 1/4 inches across. So unique, you will not see another! Enjoy.